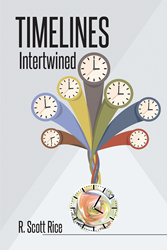 Recent release “Timelines Intertwined” from Page Publishing author R. Scott Rice is a thrilling tale of a scientist whose successful pursuits inadvertently lead to tragedy in his personal life and the destabilization of the United States as well as the world. R. Scott Rice, a former Air Force telecommunications specialist and executive head of an international engineering group, has completed his new book “Timelines Intertwined”: a gripping science fiction novel that demonstrates in catastrophic detail that certain aspects of existence should not be tampered with, time being one of them. Published by New York City-based Page Publishing, R. Scott Rice’s exciting tale introduces Clay Ambrose, whose childhood infatuation with the H.G. Wells classic “The Time Machine” serves as foreshadowing into the contorted and confusion future that awaits him. Clay marries a woman of superior intellect like himself and sets about his life’s purpose of creating a working system of time travel. The TYMESuit is born, and for a while its success is a beautiful addition to his incredible life that is full of familial support, marital bliss, and academic pursuit. However, in spite of the time travel capability he has created for himself, mistakes are made and the repercussions are unthinkable, not only for himself but for his country. Now alone and in danger, Clay must try to undo the harm his time travel has caused before it is too late for more people than just his beloved wife. Readers who wish to experience this fantastic work can purchase “Timelines Intertwined” at bookstores everywhere, or online at the Apple iTunes store, Amazon, Google Play or Barnes and Noble.